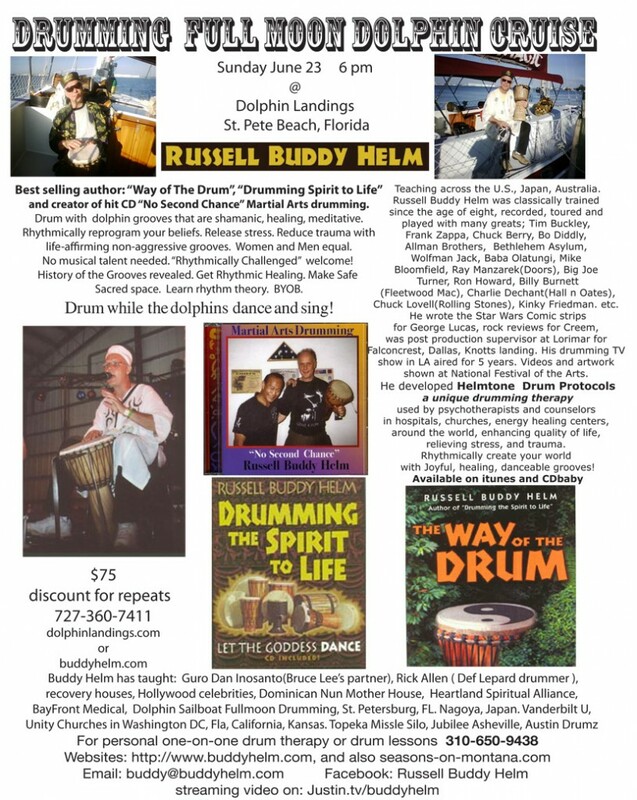 We are going out this Sunday July 23 on a full moon sailboat cruise with drumming for the dolphins on St. Pete beach. We are gathering at Dolphin Landings behind Dolphin Plaza (Southern end of St. Pete Beach just north of Don Cezar on the inland waterway side) around 6 pm and will return about 9pm. Charge is $75. Repeats are discounted 15%. We will have drums. It is an exciting and inspirational cruise. Attached is a flier for the event. You can sign up ahead of time online at http://www.buddyhelm.com/full-moon-dolphin-watch-drumming-sailboat-cruise or DolphinLandings.com. The phone number for the sailboat office is 727-360-7411. This entry was posted in dolphin drumming, Dolphin Sailboat Full Moon Drumming, healing drums. Bookmark the permalink. I was lucky enough to be introduced to drum circle of yours in Palm Harbor at a Metaphysical book store, I think it was called Oak Trail books, maybe 4-5 yrs ago. I was always sorry I missed the full moon boat drumming. No drumming circle has seemed significant as that one. If you have an itinerary or mailing list may I be added to it.